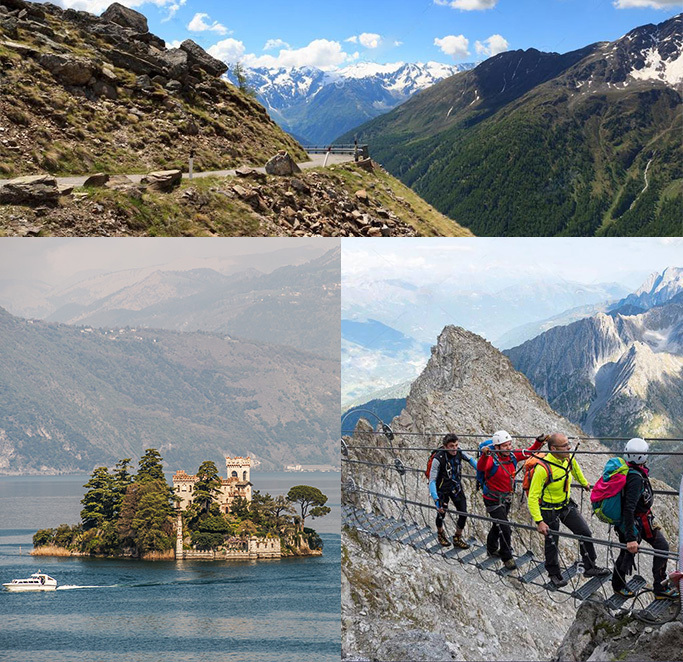 We offer three days riding on the most famous Giro d’ Italia alpine passes and a beautiful lake: Mortirolo Pass, Gavia Pass, Lake Iseo and Montisola. These mountains provided the spectacular background to some of the greatest battles between unforgettable road bike champions. 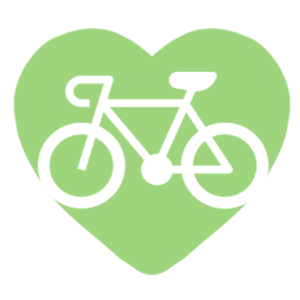 They are demanding ascents, but with our guide and with the constant support provided by our minibus, all cyclists with average training can deal with this challenge. At the top of the pass, our minibus will be waiting for us with dry clothes so we can enjoy an amusing descent towards new enchanting valleys. In between this bike days there will be three days with the expert Valle Camonica-Adamello Mountain Guides. They will guide us on the spectacular Sentiero dei Fiori, an easy via ferrata that goes along the Passo del Castellaccio-Passo Lagoscuro ridge ,where great battles were fought during the First World War. We will conclude this week with two days at Rifugio Garibaldi, reaching Monte Venerocolo (m. 3136) with its magnificent view on the Adamello Glaciers, Ortles-Cevedale group, Bernina group, on the second day. Hotel Belvedere will be the enchanting accommodation for our vacation, surrounded by the splendid natural landscapes and far reaching views of Mortirolo Pass, and where we will be rewarded for our efforts with its delicious local dishes tasting good wine and relaxing on its panoramic terrace. Transfer from Edolo station to Albergo Belvedere, Mortirolo pass. Welcome from the staff and tour presentation. After breakfast we transfer with our minibus towards Ponte di Legno, a famous ski resort. 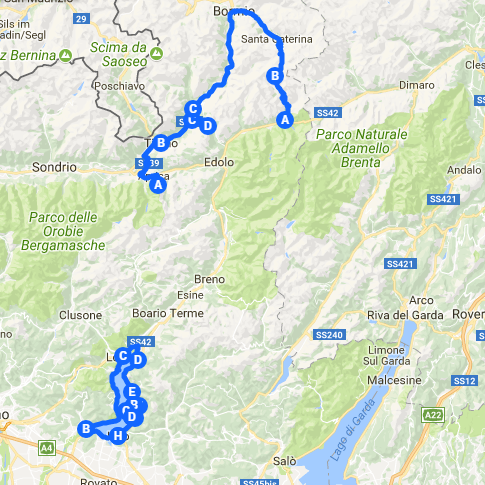 Starting off from Ponte di Legno the first step on our tour will be the least demanding pass of the week: Gavia Pass. This legendary road is 17 km long and with an average gradient of 7/8% and a maximum of 16%. After we have left the town centre we pedal towards our destination going through Valle di Pezzo, where the road is wide and not yet steep. 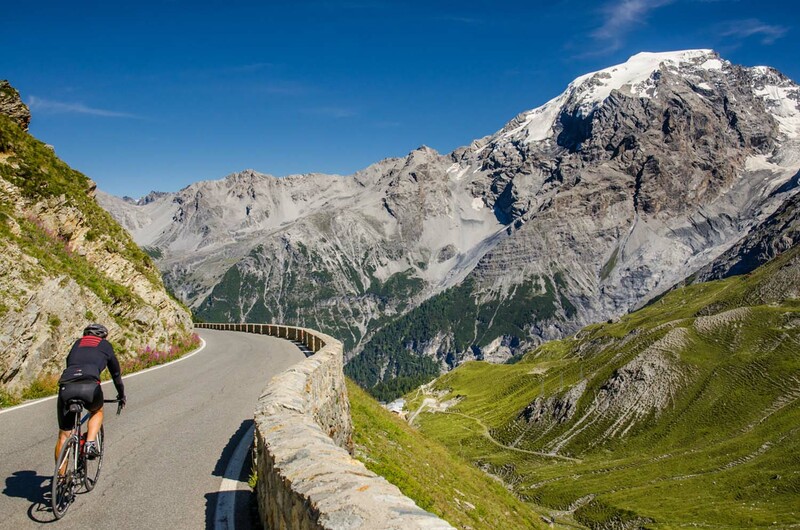 Reaching Sant’Appallonia, an enchanting hamlet, we start with the real Gavia Pass road. At first it is still a wide road but soon it becomes a narrow mountain road. Until some years ago, this was a dirt road, but today it is well tarmacked. 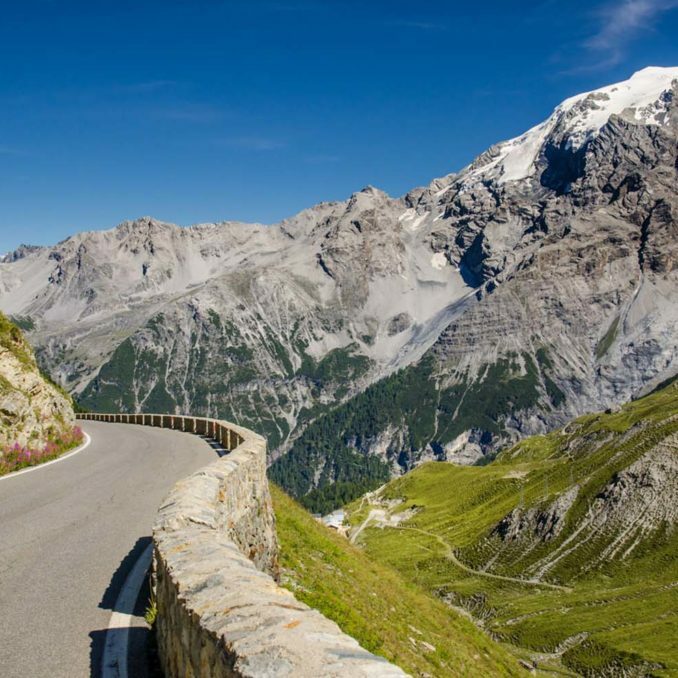 Cycling here is demanding but with our guide and the always available assistance from our minibus all of us will reach today’s goal, the Gavia Pass. After changing into dry clothes from our van and after eating biker’s snacks,we go down in an amusing descent, towards Bormio, famous ski resort where some World Ski Championship races take place. 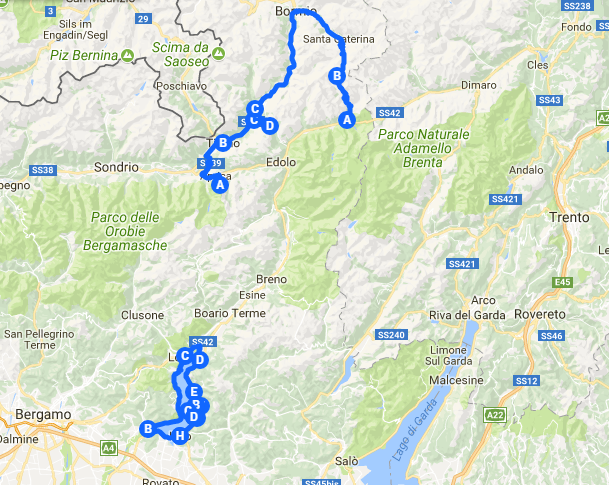 We keep riding in Valtellina on the main road through historic villages; when we arrive in Mazzo in Valtellina we load our bike on our minibus and return to Albergo Belvedere for a relaxing evening in good company tasting special local dishes. Another exciting day is waiting for us. Today our bikes can have a rest! 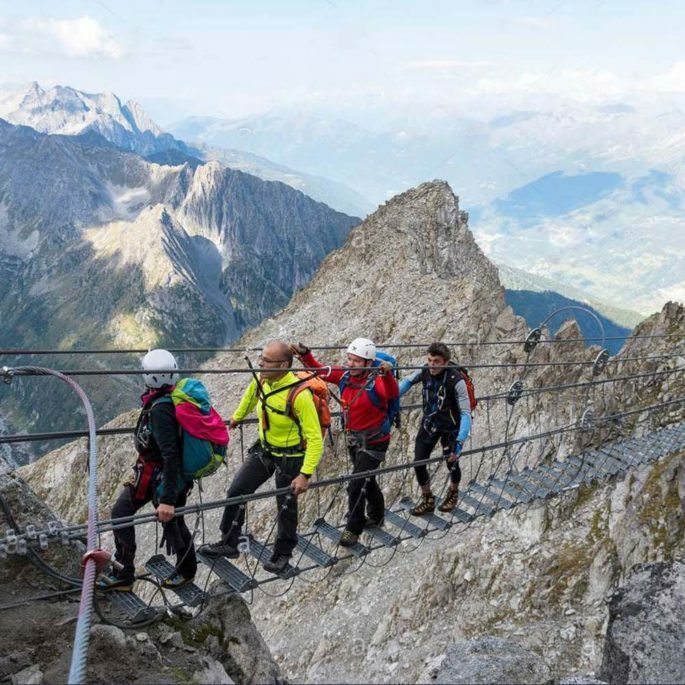 After putting on hiking boots and warm clothes we transfer to Tonale Pass where an expert Mountain Guide will take us on high up to Sentiero dei Fiori, a Via Ferrata which is accessible to all those who aren’t afraid of heights where you can see some of the rarest flowers of the high mountains. We take the Paradiso cable car until Capanna Presena, where our adventure starts. 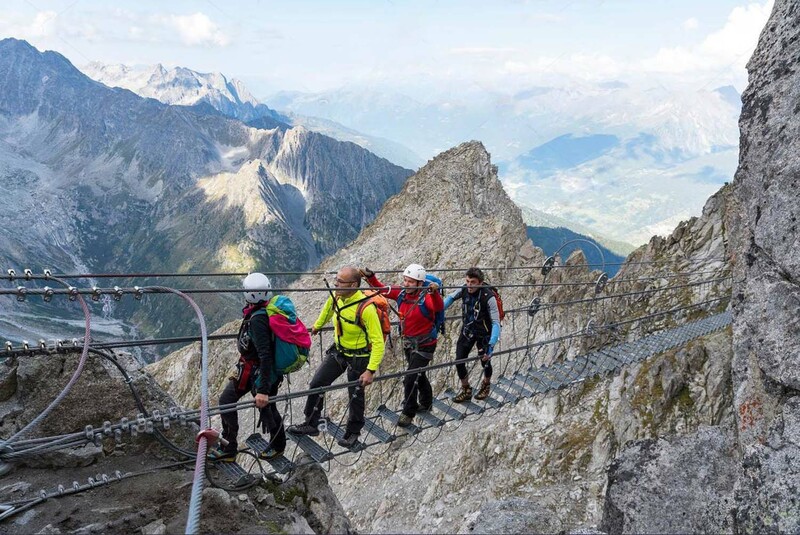 Completely renewed by the Vallecamonica-Adamello Mountain Guides, this highly spectacular path runs between Passo Castellaccio and Passo Lagoscuro, it is an easy Via Ferrata and our Mountain Guide provides us with all the necessary equipment. In this eagle’s nest, great but bloody battles were fought by the Italian and Austrian soldiers during the First World War. They lived here even in the winter in hard conditions, with very low temperatures and with the threat of avalanche. After this historic hike we come back to our Hotel, where we can enjoy a very good “aperitivo” on its panoramic terrace. An enjoyable and easy day with our road bikes around an enchanting lake: Lake Iseo. 75 Km, 0 difference in altitude. With our minibus we reach Lovere, picturesque town with a pleasant lake front, where our day’s trip starts. All day we keep cycling alongside the lake, with a marvellous landscape and passing through several small lakeside villages. We ride towards south until we reach the town of Sarnico, here we leave the lake road and head to Franciacorta. This territory is famous all over the world for its good wine, we ride between important vineyards: Berlucchi, Ca’ del Bosco, Bellavista. Back on the road around the lake, the largest European lake island is waiting for us: Montisola. 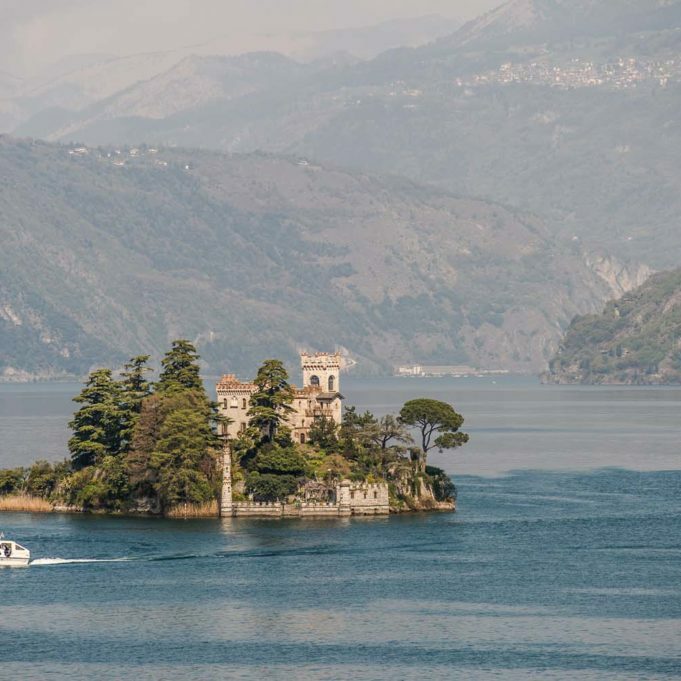 This island became famous worldwide in 2016 when it hosted the project of Christo: The Floating Piers, a pedestrian footbridge across the lake. 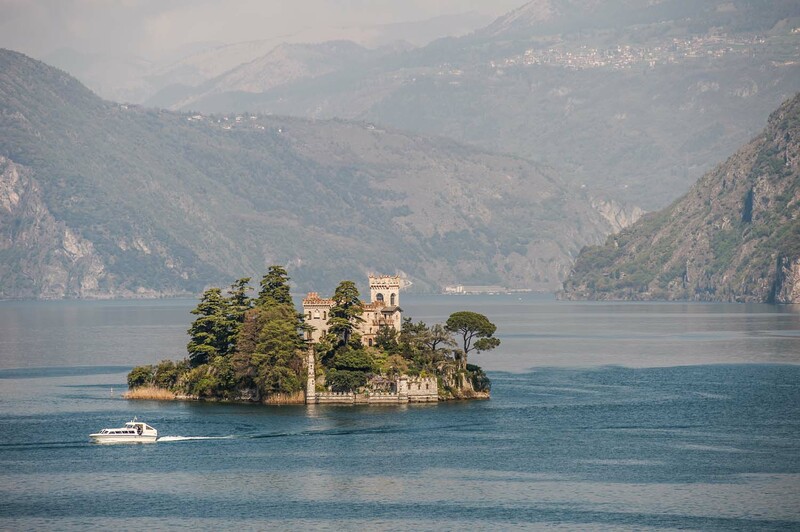 Cars are not allowed on the island, so we can ride on the peaceful road alongside the lake and on the island hills, we are in the centre of the lake with a breathtaking view. Back on the mainland we finish our loop where it started. We come back to our hotel, in the heart of the mountain to relax on its terrace drinking a delicious Italian aperitivo. Today we ride our road bike into “history”, we deal with the epic Passo del Mortirolo. 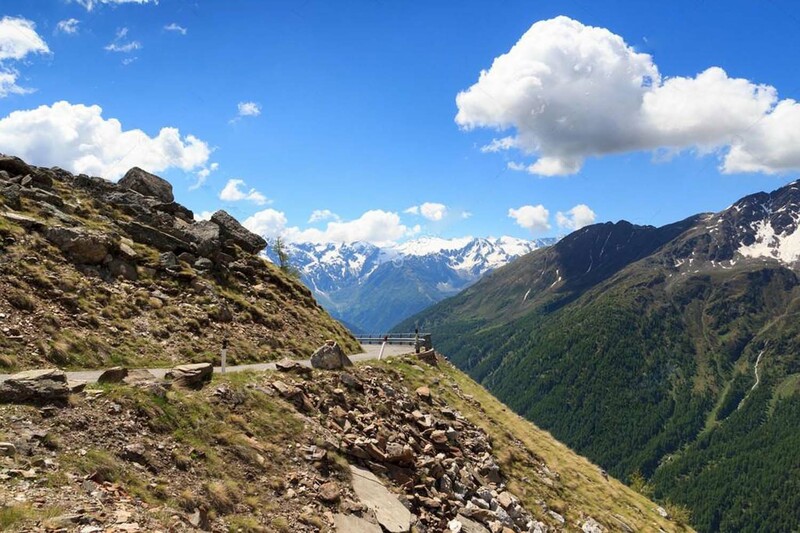 This famous ascent starts from Mazzo in Valtellina and reaches the Mortirolo Pass after 12.5 km. The difference in height is 1300m and the average gradient is 10% with the maximum 18%. 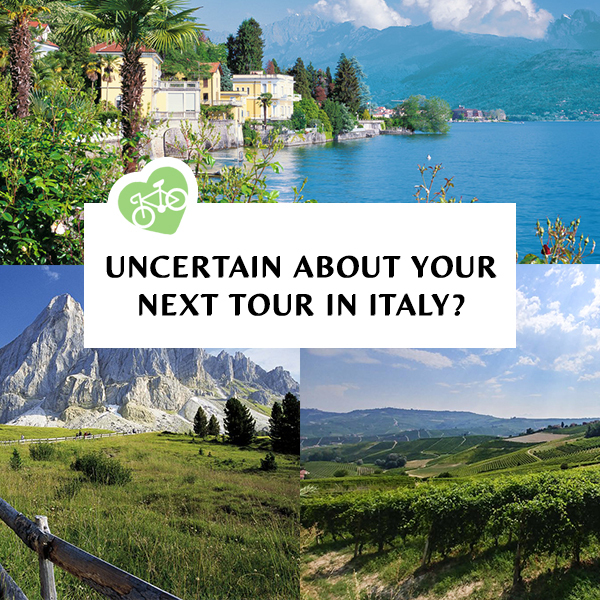 This feature makes this ascent one of the hardest in Europe and it has became famous since it was included in the Giro d’Italia in 1990. It was here that, in 1994, the great Marco Pantani broke free, winning the stage, and in memory of the epic endeavours of the “Pirate” a monument was placed in his honour at Km 8 on the Valtellina side in 2006. 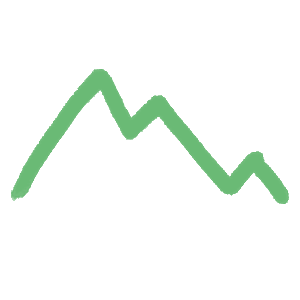 There’s no need to worry, supported by our guide and with the minibus following us, all of us will get to the top and today we will arrive directly at Hotel Belvedere where the owners will be waiting for us with a succulent meal. After this epic ascent with our road bikes, we will have time to relax the next morning. Then, just after lunch we transfer for two incredible days in the high mountains, sleeping in a typical refuge. Always accompanied by an expert Alpine Guide, we park near Malga Lavedole (1584m.a.s.l. ), from here we have to reach RifugioGraribldi (2550m.a.s.l. ), this hike will take us 3 hours, we’ll walk alongside some lakes created by dams surrounded by the dramatic granite landscape. When we reach the refuge, we can admire the majestic Adamello North Face with its glacier. We’ll spend the night in this alpine refuge, after dinner together. Waking up early in the morning and after breakfast, we put on our hiking boots and head to Monte Venerocolo. In two hours we arrive at the Venerocolo Pass (3136m.a.s.l. ): here the view stretches from Pisgana glacier to Monte Presanella. From here, climbing up through old huts used by the soldiers during the First World War, in half an hour we get to the top of Monte Venerocolo (3323 m.slm). A fantastic view is the reward for our efforts, we can see the Pian di Neve glacier, Ortles-Cevedale and Bernina Range. 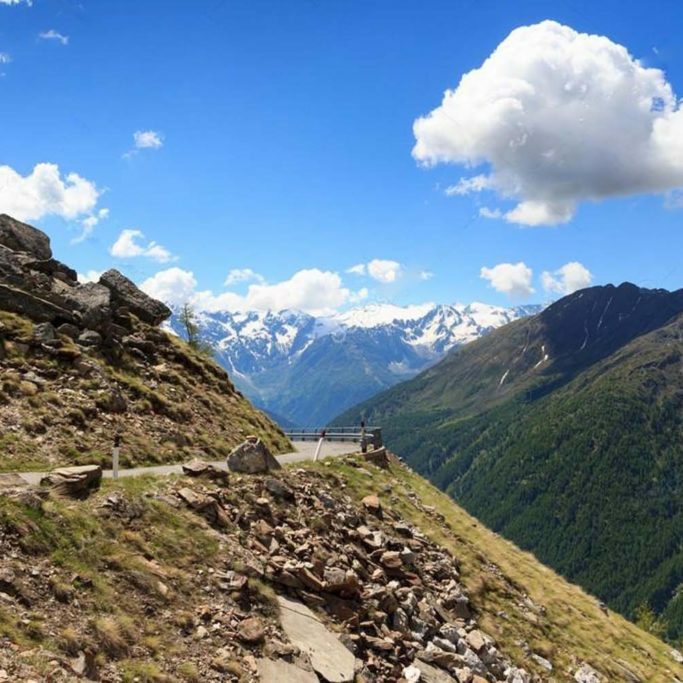 A BIKE TOUR ON THE MOST FAMOUS GIRO D'ITALIA PASSES AND A TREKKING TOUR ON ADAMELLO GLACER WITH PROFESSIONAL GUIDE.